A microwave oven, commonly referred to as a microwave, is a kitchen appliance that heats and cooks food by exposing it to microwaves in the electromagnetic spectrum. The microwaves are absorbed by water, fats, sugars, and certain other molecules present in the food, whose consequent vibrations produce heat. The heating thus occurs inside the food, without warming the surrounding air; this greatly reduces cooking time, and baking and other cooking tasks that require hours in a conventional oven can be completed in minutes in a microwave oven. Should You Buy a Microwave Oven? The food cooked in a microwave is considered healthier as it uses less oil. Also, a microwave oven is energy-efficient as it cooks food faster and uses 70-80% less energy than a traditional one. So, you can save on electricity bills and LPG cylinders. This section will tell you how to decide and buy the best microwave oven according to your needs. Consider it as a microwave oven buying guide. This is the most important point to decide because you will have to live with your choice for a significant amount of time. Microwave ovens come in three different types- Solo, Grill and Convection. Solo Microwave Oven is an entry-level model. It comes with a ‘Microwave only’ mode. If you are looking for basic cooking solutions, a solo model would be the ideal choice. With uniform heat distribution, multiple power levels and a host of other features, the Solo microwave oven is ideal for all basic cooking functions besides defrosting and reheating. However, it can not perform the baking, grilling and roasting functions. Hence it can be used for simple cooking purposes. A grill microwave oven is a solo microwave equipped with heating coils and can be used to grill, toast or roast food. The grill comes as a mode or setting in microwaves and requires the use of a grilling plate or a metal rack, which brings the food closer to the grill. But grilling can be used in combination with microwave to cook different kinds of food. For example, you can use both these functions simultaneously while cooking chicken legs, fish or paneer dishes. Now you are confused about how to choose between these 3 types. Don’t worry! 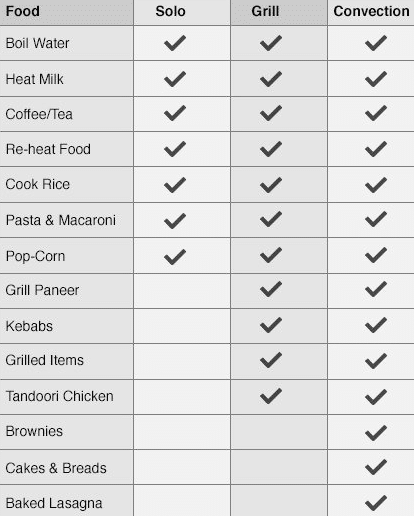 Think about the food you would cook and choose the appropriate type of microwave oven using the table given below. The capacity of a microwave oven is measured in litres(L), which is the volume of space available inside. It is very important to buy the right size of a microwave or you will end up wasting your time and electricity every time you use a microwave of the wrong size. 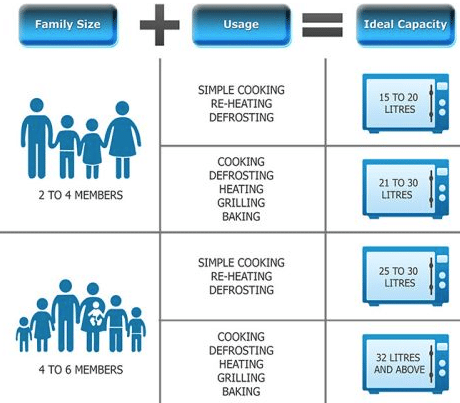 While purchasing a microwave oven, you should consider the power rating based on your usage. The output power or wattage of a microwave oven is measured in Watts. Microwaves generally have a power rating between 600 and 1,500 watts. If you cook larger quantities of food, like dinner for a large family, opt for a microwave with a higher power. A microwave with a higher wattage cooks food faster but is more expensive as well. The Auto Cook Menu feature comes with preset programs to simplify the preparation of a variety of dishes. Just select the type of dish (code) along with its weight and the oven will automatically adjust the power and cooking time. All microwaves can defrost food, but it’s best to opt for one that has auto defrost, where you only need to select the type and weight of food and the microwave selects the best program for you. It will defrost all types of food like chicken or paneer, without cooking it. IFB 17PM-MEC1 17 L Solo Microwave Oven is the best microwave oven in India. 2. Its wattage is 1200 Watts. 3. It has 5 flexible power levels that ensure optimum heating of your food. 4. It defrosts food quickly by setting the time using the speed defrost feature. 5. The 3 Auto Cook menus facilitate to get food cooked fast. Enter the weight and leave the rest to the Auto Cook feature. 6. Using the inbuilt electromechanical timer, the power output can be set as per the need. 7. It comes with a 1-year warranty on machine and 3 years warranty on Magnetron and Cavity from IFB. Bajaj 1701MT 17 L Solo Microwave Oven is the second best microwave oven in India. 3. It features 5 different power levels. 4. It has a defrost function that helps to thaw frozen food. 5. It is designed with a timer feature that helps in setting the cooking duration. 6. It comes with 30 minutes of a cooking timer. 7. This timer allows for choosing the preferred time for cooking. 8. It comes with a 1-year warranty from Bajaj. 8. It comes with a 1-year warranty on the product and 5 years warranty on magnetron from LG. IFB 20SC2 20 L Convection Microwave Oven is the fourth best microwave oven in India. 6. It is capable of three-level Multi-stage Cooking across microwave, grill and convection modes. 8. It comes with a 1-year warranty on machine and 3 years warranty on Magnetron and Cavity from IFB. 2. Its wattage is 1400 Watts. 7. It is capable of three-level Multi-stage Cooking across microwave, grill and convection modes. IFB 30BRC2 30 L Convection Microwave Oven is the sixth best microwave oven in India. 4. It is capable of three-level Multi-stage Cooking across microwave, grill and convection modes. 8. It comes with a 1-year warranty on product and 3 years warranty on Magnetron and Cavity from IFB. IFB 25SC3 25 L Convection Microwave Oven is the seventh best microwave oven in India. 2. Its wattage is 2000 Watts. 3. It comes with 26 auto cook menus. 4. Combination Cooking + Multistage Cooking feature blends the magic of the combination cooking feature (microwave and grill modes) and the intelligence of the multi-stage cooking (three levels of cooking across the microwave, grill and convection modes) to cook up memorable meals. 5. Keep Warm feature delivers a very low power microwave pulse that keeps the temperature of your food at a constant level-without overcooking. IFB 30FRC2 30 L Convection Microwave Oven is the eighth best microwave oven in India. 6. Power Save is a variable power and bill saving feature that offers pre-set choices depending on your menu. 7. Steam Clean features free the microwave from grease in a matter of minutes using steam. LG MS2043DB 20 L Solo Microwave Oven is the ninth best microwave oven in India. 2. Its wattage is 700 Watts. 3. i-wave technology ensure faster and healthier cooking by circulating microwaves evenly inside the cavity. 4. Anti Bacteria Cavity reduces bacteria growth inside the cavity and hence avoids odour formation. It also helps in easy cleaning. 5. With the Next Step Guide, a text is displayed to help you navigate easily. This feature makes the oven easy to use. 6. It comes with 44 auto cook menus. 7. It comes with a 1-year warranty from LG. Morphy Richards 25 CG with 200 ACM 25 L Convection Microwave Oven is the tenth best microwave oven in India. 3. It comes with 11 power levels. 4. It comes with 200 Auto cook functions. 5. Auto defrost feature provides automatic defrosting and cooking in a single step. 6. Deodorize function feature ventilates and freshens the cavity when it gets permeated with smoke and strong odours. 7. Overheat sensory protection feature automatically shuts off the operation in the event of overheating. 8. It comes with 2 years warranty from Morphy Richards. Very useful post..! What are your thoughts about convection microwave? Thanks. Convection microwave ovens are great for people who bake cakes. Hi! By far I could understand more about different types of ovens. I m confused with the brands ad their utility and performance. I wish to buy an electric oven not OTG, in which I can regularly bake cakes, breads, cookies, muffins and also prepare Marconi lasagne etc etc n bake a little. This is for a family of 6 people. Pls suggest asap. Awaiting your response. Hi, I would suggest you to go with LG MC2886BRUM 28 L Convection Microwave Oven. In convection microwaves, which one is the best…!? For convection microwaves, see this post: 10 Best Convection Microwave Ovens in India. Many thanks for the proper research and giving it to us ready-made 🙂 Whats your opinion about latest Samsung slim fry models? I understand that they are expensive… but otherwise ? Hi Priyamwada, since these models are new, currently I cannot give an opinion on them. Thanks. Great review. Other sites seemed promoting products. You started with the base first – what is , do you require one, etc.